This is a stunning French Sèvres "Bleu Celeste" hand painted porcelain and ormolu urn converted into a lamp, circa 1870 in date. The ovoid porcelain body is painted with three gilt-framed panels depicting cherubs on a blue celest ground which is suspended on three cabriole legs terminating in paw feet on a tripod base. Add an elegant touch to any room in your home. Condition: In excellent condition with no chips, cracks or signs of repair, re-wired please see photos for confirmation of condition. 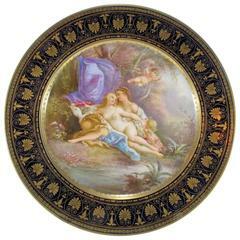 Dimensions in cm: Height 47 x width 20 x depth 21 Dimensions in inches: Height 18.5 x width 7.9 x depth 8.3 Sèvres Porcelain traces its roots in France to early craftsmen who had small manufacturing operations in such places as Lille, Rouen. St. Cloud, and most notably Chantilly. It is from Chantilly that a cadre of workers migrated to the Chateau de Vincennes near Paris to form a larger porcelain manufactory in 1738. French King Louis XV, perhaps inspired by his rumoured relationship with mistress Madame de Pompadour, took an intense interest in porcelain and moved the operation in 1756 to even larger quarters in the Paris suburb of Sevres. Sevres was also conveniently near the home of Madame de Pompadour and the King's own Palace at Versailles. From the outset the king's clear aim was to produce Sèvres Porcelain that surpassed the established Saxony works of Meissen and Dresden. Though the French lacked an ample supply of kaolin, a required ingredient for hard-paste porcelain (pate dure), their soft-paste porcelain (pate tendre) was fired at a lower temperature and was thus compatible with a wider variety of colours and glazes that in many cases were also richer and more vivid. Unglazed white Sèvres Porcelain "biscuit" figurines were also a great success. However, soft-paste Sèvres Porcelain was more easily broken. Therefore, early pieces of Sèvres Porcelain that remain intact have become rare indeed. The Sèvres Porcelain manufactory always seemed to be in dire financial straits despite the incredibly fine works it produced. In fact, the king's insistence that only the finest items be created may have contributed to the difficulties. Only a limited number of European nobility could afford the extravagant prices demanded for such works. King Louis XV and eventually his heir, the ill-fated Louis XVI, were obliged to invest heavily in the enterprise. Ultimately, the Sèvres Porcelain Factory produced items under the name of "Royal" and thus the well-known Sevres mark was born. King Louis XV even mandated laws that severely restricted other porcelain production in France so as to retain a near monopoly for his Sèvres Porcelain. The king even willingly became chief salesman for the finest of his products, hosting an annual New Year's Day showing for French nobility in his private quarters at Versailles. He eagerly circulated among potential buyers, pitching the merits of ownership and policing the occasional light-fingered guest. Sèvres Porcelain may have indeed given the makers of Meissen and Dresden a run for their money by the end of the 18th century but for the French Revolution. By 1800, the Sèvres Porcelain Works were practically out of business due to the economic devastation of the new French Republic. About the time when Napoleon Bonaparte named himself Emperor of France (1804), a new director was named for the Sèvres Porcelain manufactory. Alexandre Brongniart, highly educated in many fields, resurrected Sèvres Porcelain. Soft-paste porcelain was eliminated altogether thanks to the earlier discovery of kaolin near Limoges. For four decades until his death, Brongniart presided over monumental progress for Sèvres Porcelain, catering not only to Napoleon himself, but at last to include the more financially profitable mid-priced market in the emerging middle class. Ormolu (from French 'or moulu', signifying ground or pounded gold) is an 18th-century English term for applying finely ground, high-carat gold in a mercury amalgam to an object of bronze. The mercury is driven off in a kiln leaving behind a gold-coloured veneer known as 'gilt bronze'. The manufacture of true ormolu employs a process known as mercury-gilding or fire-gilding, in which a solution of nitrate of mercury is applied to a piece of copper, brass, or bronze, followed by the application of an amalgam of gold and mercury. The item was then exposed to extreme heat until the mercury burned off and the gold remained, adhered to the metal object. No true ormolu was produced in France after around 1830 because legislation had outlawed the use of mercury. Therefore, other techniques were used instead but nothing surpasses the original mercury-firing ormolu method for sheer beauty and richness of colour. Electroplating is the most common modern technique. Ormolu techniques are essentially the same as those used on silver, to produce silver-gilt (also known as vermeil). Sevres porcelain centerpiece. 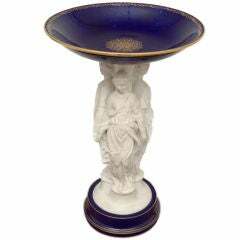 White bisque caryatids with a cobalt blue dish. 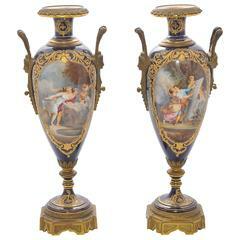 A fine quality pair of 19th century French 'Sevres' porcelain vases, each having wonderful gilded ormolu mounts. 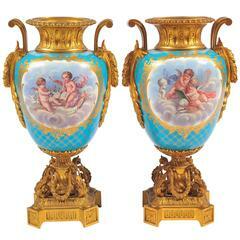 The classical romantic and cherub scenes set in turquoise background.